There has never been a more exciting time to study Anglo-Saxon history. Recent archaeological discoveries are transforming our understanding of the narrative of early English history and have added new layers of meaning to our existing knowledge. New methodologies such as the study of landscape and of gender have challenged assumptions, for example, about the wealth and sophistication of the early kingdoms or the role of women in politics and society, while historians are finding fresh approaches to long-established subjects such as the scholarly achievement of the eighth-century monk, Bede. Material culture − manuscripts, coins, buildings, metalwork and other artefacts – is now fully embedded as an integral and vital element in the interpretation of the pre-Conquest period. 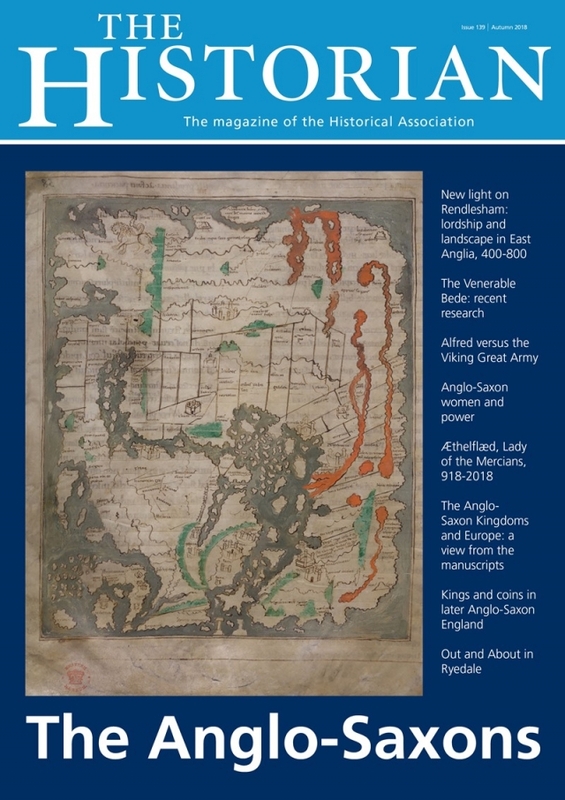 This edition brings together some of the latest research and findings on many aspects of the early medieval English past to encourage and stimulate readers to explore for themselves its riches. Traces of the Anglo-Saxon period can be found not only in museums and libraries but also in surviving buildings, like Bede’s churches at Jarrow and Wearmouth, and in the landscape itself which can be explored on foot, by bike or car. The wealth of easily available translations of Anglo-Saxon writings such as those of Bede and the high-quality internet resources such as British Library’s online images of its manuscripts and texts (www.bl.uk/anglo-saxons) makes this once daunting and inaccessible period open for all to explore and enjoy. One of the long-term intentions of The Historian is to present up-to-date historical research to Historical Association members in as accessible way as possible, so that they can be kept abreast of modern-day research. We inherited this commitment from the long-standing Historical Association pamphlets series, some of which can still be accessed today in digital form, when The Historian was launched in 1983. This edition, firmly aimed at Anglo-Saxon England, fulfils that commitment wonderfully well. We are being guided into contemporary research into an historical world of over one thousand years ago and we are introduced to all the possibilities of modernday research. For this we have to thank our guest editor, Catherine Cubitt, for assembling such a strong team of contributors. We are fortunate to live in a society which respects and values historical evidence, the very materials from which future generations will develop new historical analyses and narratives. At this moment the various media are reporting on archaeological excavations at the starting point of the High Speed Train route at Euston and at the planned terminus at Birmingham’s former Curzon Street Station. The scale of the excavations is enormous; it is being said that the work at Euston is the largest excavation in Europe, employing over 100 archaeologists. Many more sites along the route of the High Speed Train are also expected to yield very substantial quantities of evidence. Obviously this is a controversial development but, now that it is proceeding, we can only hope for good-quality evidence to be shared with us. Having witnessed the whole process of the construction of the M6 Toll Road, where archaeologists were in attendance all along its 27-mile route, the evidence yielded has been instrumental in developing our understanding of human settlement and life along that route. For example, it had always been assumed that any burials from the Roman settlement at Wall (Letocetum) had been elsewhere, possibly on the nearby Greenhill at Lichfield, where there is incontrovertible evidence of pagan burials: the archaeologists overturned that belief with the discovery of about 50 urns containing cremated remains at Wall. By scale what evidence may emerge from the High Speed Train route will substantially overshadow that smaller exercise in changing our infrastructure. Historical awareness can come in many ways and from a very pleasing range of directions. On 24 October the Metro reported that a digger driver working on the A14 between Cambridge and Huntingdon had unearthed a woolly mammoth tusk and four rhino bones, possibly as much as 100,000 years old. He was reportedly very excited by his discovery and this illustrates the public mood in relation to the discovery of tangible historical evidence. This public mood has been encouraged by the work of the Portable Antiquities Scheme, to which one of our book reviews refers. This has been a very effective means by which ordinary members of the public have been encouraged to report any very local discoveries that they may have made. It has been a way of harnessing the parallel enthusiasms of metal detectorists and has brought them into the process of celebrating what may have been discovered in an historical and aesthetic sense, alongside the monetary possibilities. The scale of public support for, and indeed interest in, history represents a huge opportunity for the Historical Association, nationally and locally. Our annual national Conference – at Chester in 2019 – is a highly-regarded forum for the exchange of ideas; our work with teachers of every kind is the envy of other similar organisations; our initiatives for younger people are highly regarded; and we have a local presence. This latter is the subject of current research and development, with the hope that more local branches can be formed. Existing experienced branch officers can advise on how to proceed but the target must be to achieve a presence in all large towns across Britain and Northern Ireland, to complement our county branches. We can be very optimistic about our future.